Dental implants are defined as prosthetic tooth replacements that have been in use for several years now, and proven to be quite safe and comfortable to be used by adults. These implants are inserted on spaces in the jawbone which were formerly occupied by the damaged or lost tooth. Dental implants don’t call for removal unlike dentures when cleaning them. They are manufactured to replace the role of the damaged tooth by screwing a prosthetic crown to an artificial dental root. These are minute titanium screws about the size of an adult tooth crown that are placed on the upper or lower jaw. They serve as a permanent replacement for missing teeth. The titanium screws are secured in place by boring a hole directly on the jawbone. It is then left to heal for several weeks until a new crown is placed. Dental implants have been used successfully for over 40 years, with the first published landmark research documenting the successful osseointegration of titanium implants in (1969). 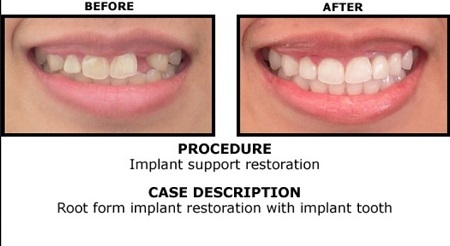 Implants have become the treatment of choice in many, if not most, situations when missing teeth require replacement. The implant is made up of titanium fixtures that are inserted into the jaw bone and used to replace the missing tooth root. 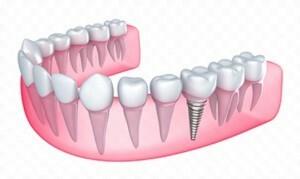 Then a crown will be screwed into the implant to replace the crown of the tooth. You can have dentures or bridges, but dental implants are permanent replacements for missing teeth. They are highly durable and very functional at the same time. How does it help with teeth replacement? First of all, the implant is installed directly on the jawbone in the absence of a tooth. An abutment, which is a special contraption for the process will then be attached to the titanium screw, preparing the tooth spaces for the installation of the crown later on. A porcelain or ceramic crown will be installed afterwards. Together, the titanium screw and the porcelain implant would resemble the natural appearance and function of the missing tooth. The soft tissue that covers the jawbone shall be assessed first of all for integrity. The quality and quantity of the jawbone should also be tested for integrity as well, that’s why diagnostic tests and lab works are necessary prior to implant installation. To guide your dental practitioner from beginning to end, images shall be taken in order to note down discrepancies, changes, or improvements on the oral cavity structure of the patient as the treatment procedure goes on. Your dentist need to make sure that all your laboratory results and diagnostic tests should all be satisfactory before you will be cleared for treatment. If not, the scheduled operation may be postponed for some time in order to achieve the best results. Which treatment suits my needs best? An initial consultation at Sydney Cosmetic Specialists will help to guide you on deciding which dental treatment plan is best for you. Options shall be presented to you and our leading dental practitioner Dr. Potres will guide you through the particulars of each treatment option.